Grape is not only very tasty and refreshing but it also has healing properties. It acts as a natural body tonic, slows aging, prevents dementia and degenerative diseases, cleans the blood, removes the fat from the body, strengthens the heart and etc. Although grape raisins remains had been found in Egyptian pyramids and tombs of Central Asia and Eastern Europe, it is considered that the Greeks have began to cultivate grapes and make wine, mixing it with herbs and honey. Purple grapes contain lots of fruit sugar (18-20%), providing a high energy value, so 1 kg of grapes can replace 25 to 30% of daily energy needs. It contains plenty of vitamin C and smaller amounts of vitamin B1, B2, B6 and carotene. Also grape is rich in minerals - potassium, calcium, iron, phosphorus, magnesium and boron. Purple grapes contain phenolic substances that provide color and flavor, resveratrol, anthocyans and antioxidants (catechins, quercetin) that provide a healing effect. Usage of purple grape juice is especially advisable for cardiac patients because purple grape is characterized by the absence of sodium and chlorine, and the presence of potassium, which leads to a drop in blood pressure. Grapes also preventively effect heart diseases by increasing the protective HDL cholesterol and decreasing blood coagulation. Purple grapes prevent osteoporosis. They contain plenty of calcium and magnesium, leading to the bones strengthening. In addition they contain boron which prevent calcium loss and increase the level of estrogen, which strengthens bones, protects the heart and relieves climax symptoms. Thanks to antioxidants content, purple grapes destroy free radicals and prevent oxidation of cholesterol, the development of arteriosclerosis, the appearance of tumors and the aging process. Given that grapes are rich in resveratrol, they provide longevity. It is considered that quercetin prevents the occurrence of cancer. Due to the boron content, purple grape juice influences on the electrical activity of the brain, increasing the motor and mental activities. 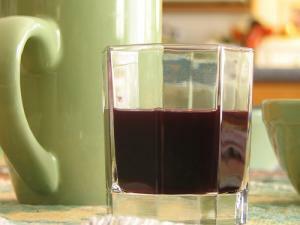 Flavonoids in purple grape juice provide anti-inflammatory and anti-allergy effects. Regular and moderate consumption of red wine improves antithrombotic activity, preventing myocardial infarction, stroke and venous thrombosis. It is important to drink red wine during a meal to directly reverse the effects of food factors that promote blood clotting. Taking large quantities of wine may stimulate clotting and lead to fatal heart disease. Because of that, wine should be replaced with purple grape juice that provide the same benefits, but with no above mentioned side effects. Fresh purple grape juice is recommended because it is rich in vitamins A, B and C, as well as in various minerals. It is the remarkable liver cleaner and also helps in eliminating urinary acid from the body.